This article was posted by Editor on May 9th, 2011 and filed under In-depth, Top. You can follow any responses to this entry using RSS 2.0. Both comments and pings are currently closed. SA couch potatoes, rejoice! SA is getting another challenger in the television market. And the man behind it, SouthTel Group’s Oscar Dube, is optimistic the service will offer the value proposition that will attract millions of subscribers. VOD:TV, which is slated for commercial launch on 1 September, is promising a new type of pay-TV service to South Africans: transactional and subscription video on demand delivered via satellite. Similar, in a way, to the US’s Netflix, VOD:TV plans to offer SA consumers the latest movies and TV series before they are broadcast on traditional pay-TV broadcast networks like MultiChoice’s DStv. 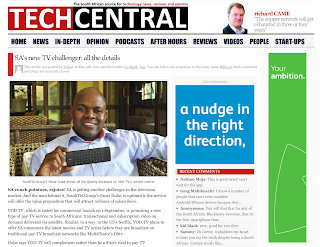 Dube says VOD:TV will complement rather than be a direct rival to pay-TV broadcasters, but TechCentral believes many SA consumers could see it as an alternative platform for their TV entertainment. Competition is also likely to be intense given that MultiChoice is said to be working on a transactional video-on-demand service of its own. Called Box Office, the MultiChoice product should be launched sometime this year. VOD:TV will deliver the latest, selected TV shows and movies to a high-definition (HD) personal video recorder (PVR) via the same IntelSat-owned satellite that MultiChoice uses to serve the Southern African region. This is important because it will obviate the need for DStv subscribers to install a second satellite dish: all they’ll need is a second “low noise block down-converter”, better known as an LNB. The service will offer free-to-air channels that are provided by Sentech over satellite, though the intention over time is to migrate to digital terrestrial television. Consumers should simply be able to install a US$15 digital tuner based on the European DVB-T2 standard once SA has defined the specifications for digital broadcasts. However, VOD:TV doesn’t offer live broadcast TV directly itself, but rather TV content that is downloaded and stored on the PVR for “on-demand” viewing by subscribers. About half the content delivered to the PVRs will be available for viewing as part of a subscription fee, which Dube says won’t be more than R200/month. The rest of the delivered content, which will include the latest Hollywood blockbusters, will be available for purchase, much like one would rent a DVD from a video store. The latest movies will probably cost in the region of R25 to R40, and consumers will have a set period in which to watch them. Unlike broadcast networks, which tend to broadcast weekly episodes of TV shows, VOD:TV will offer entire seasons of the latest series at once. Dube, whose background is in telecommunications — while working at Ericsson, he helped build MTN’s networks in Swaziland, Uganda and Rwanda — has partnered with Logiways to deliver the VOD:TV product. Paris-based Logiways, which is a spin-off of France’s giant pay-TV group, Canal+, will take a minority equity stake in VOD:TV. VOD:TV’s Linux-based PVR, which has a 500GB internal hard drive, is being built by Germany’s TechnoTrend Görler. It has an Ethernet port to hook up an Internet connection and an active USB port, allowing consumers to plug in 3G dongles to access the Internet wirelessly. An external hard drive can also be hooked up to the device to provide additional storage capacity for TV content, though Dube emphasises the box has strict conditional access and anti-piracy technology to prevent unauthorised copying.